Right now there's yet another Humble Bundle for sale and yet another Steam Sale going on, and I think there's something interesting going on here economically, because it doesn't seem like it should work. It obviously does though, because they keep doing it, and I think I've figured out why. The demand curve tells you how much of [thing] people want to buy. It points downwards since, obviously, the lower the price, the more people want. Or, taking quantity as the independent variable (which you should, seeing as it's on the x-axis, although economists don't seem awfully fussed about that convention in my experience), the scarcer something is, the more people are willing to pay to get it. The supply curve is a bit more tricky. It tells you how much of [thing] the making-thing side of the market is willing to make. 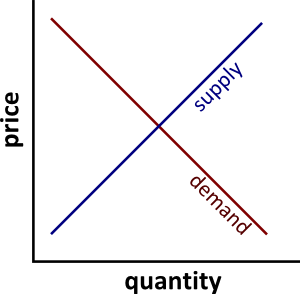 It points upwards, for the simplistic reason that at higher prices you make more money and so obviously you want to make more thing, or for the more complex but also more satisfying reason that increasing the quantity of things you make increases your costs, usually in the form of hiring extra workers, and so you have to raise prices to meet your costs. Now, normally the market price of something is at the point where the two lines cross. That is, the bit where the price people are willing to pay given the scarcity of the item (or the quantity people want to buy given its price) and the quantity the producers can afford to, y'know, produce, given that they have all these preteens sitting around talking about Justin Bieber or something and drinking all your damn lemonade. The amount of money the producers make is, pretty obviously, equal to price times quantity. And this is where things start to get interesting. With something like a game, all your costs are upfront. There's little to no cost associated with actually making more of the thing and distributing it, especially through digital platforms. So, the price of a game (and incidentally, of movies and music and stuff too - less so books, which are still tied relatively tightly to their physical medium for some reason) is based on whatever amount the studio feels they need to cover all their costs, which by this point have already been incurred (developers, software, computers, rent, caffiene, etc...) and plus make some profit. This means that they have a lot of flexibility in setting their prices since they don't have to hire extra workers to make their game. Which means they can do something like, oh, I don't know... this? Digital distribution lets them hit every point on the demand curve and plunder it for its delicious booty. And, before you start on the evil corporate spiel, this is a Good Thing. For people who make games, and people who buy them. Firstly, obviously, studios get more money. More money means they can make better games. Because games are getting really expensive. Like, live-action-movie expensive. And I just finished Halo 3 (yeah, I'm behind...) and as much as I love indie pixel fests, and as much as it's popular to bash on the Halo franchise, it was a bloody good game and I really enjoyed it. If pricing voodoo helps to get big budget games made - or heck, makes an indie game profitable enough for the dev to live off their game, that's a good thing. It means we get better games. And also, we get cheaper games. There will always be people who want the game on release day, or who love the franchise enough to buy collectors editions. There will always be people who have a tight budget and can't afford games (that would be me.) And this way, both of them get to play, and both of them get to pay a price they're willing to. Normally economists consider this a bad thing, because at market prices there's always a subset of consumers who bought the thing and would've still bought it if it cost more (in non-technical terms, "bagging a bargain"), and pricing voodoo cuts into that to get more money for the producer. And that's still true. But because there's no lower limit on the price of games, assuming bandwidth is cheap as free, it also results in the price dropping to a point way lower than it ever would for a conventional [thing], meaning that you get these massively dropped prices and a huge new audience of people who get to play games. Maybe some a little later than others, but more people having access to games has to be a good thing too.